The good news is that as well as being a great drive, the Boxster 987 is highly reliable and has an MOT pass rate that ranges from 82.3% for 2005 models to 91% for 2010 cars. However, when mechanical problems do occur, they can be expensive to fix unless they are spotted early. A comprehensive Pre-Purchase Inspection at Revolution Porsche’s Brighouse workshop will help you to identify any immediate problems and to assess the overall condition of the Boxster you are considering buying, but it is still useful to have a checklist when you go to test drive the car for the first time. Service history. An obvious point perhaps, as every car needs to be well looked after and regularly serviced, but it is particularly important for Porsches. The level of expertise needed means they should only be maintained and repaired by qualified Porsche technicians, so be careful about any Boxster that has been serviced by a non-specialist garage or that has not followed the recommended service regime. It is likely to be a sign that the car has not been cherished in the way that Porsche owners usually do. It’s a good idea to ask to look at the last service invoice, as this should include a list of advisories. It’s rare that a technician who knows these cars will miss anything that may need doing soon or even in the future, so you should get an idea of what work lies ahead. If the recommended work has been completed, the seller should have the accompanying invoices. Mileage. You can often ignore conventional wisdom about the mileage of second-hand cars, as the Boxster 987 performs better when used regularly. Low mileage ‘bargains’ are more likely to suffer from corroded brake discs, batteries that fail to hold charge, parking brakes that jam on and oil leaks from perished seals. A well maintained high mileage example may well be in better condition than a poorly maintained low mileage car. The build quality and paint on the Boxster are excellent, so any imperfection should be regarded as a warning sign. Bodywork. The build quality and paint on the Boxster are excellent, so any imperfection should be regarded as a warning sign. It may well be (poorly repaired) accident damage or the result of the car being used for track days. Make sure you ask for an explanation and for any supporting documentation if it has been repaired. Coil springs. Suspension problems are the second most common reason for a Boxster 987 to fail its MOT (after headlight/indicator issues), with broken coil springs the culprit in the majority of cases. An unlevel stance is the giveaway for coil spring issues, but knocking or groaning noises when manoeuvring or travelling over rough road surfaces are also a bad sign. RMS. Both 986 and 987 Boxsters are vulnerable to rear main oil seal failure, which is expensive to repair as the gearbox needs to be removed in order to fit the replacement seal. Fortunately, the consequences of RMS failure are generally nothing more serious than a small oil leak and a repair can usually be delayed until the car needs a bigger job doing, such as a clutch replacement. But, it is well worth getting a Porsche specialist to assess the severity of any oil leaks before you actually buy the used Boxster. IMS failure. One issue you are certain to have read about when researching whether to buy a Porsche is the notorious IMS bearing failure, which caused catastrophic engine failure in some cars. Fortunately, it is unusual on Boxster 987s, as the standard factory fitted bearing was upgraded and relocated to inside the crank case in 2006, and almost every 987 available on the second-hand market has the new stronger bearing. If you view one of the very earliest 987s from 2005, ask whether the highly effective retrofit solution has been fitted. If not, it is well worth investing in an inspection by a Porsche specialist to check whether IMS problems are imminent. Tyre wear. Rapid and uneven tyre wear is a major problem on Boxsters where the wheel alignment is not right. It’s awkward to check when the car is on the floor as more often than not the wear is on the inside edge, which on the rear tyres, is very difficult to see. If the tyres appear more worn on the inside or outside edges rather than straight across, the car is likely to need wheel alignment work in the near future. However, accelerated tyre wear can also be a sign that the suspension bushes are failing; if this is the case you are likely to hear a squeaking noise when going over speed bumps or potholes during the test drive. Either way, it is sensible to get an expert opinion before buying. It is sensible to get an expert opinion before buying a used Porsche. Transmission. While the manual, tiptronic and PDK transmissions for the Boxster 987 are all highly reliable, the long service intervals recommended by Porsche mean that problems can go unnoticed until they require extensive work. Among the signs to look out for during the test drive are clicking sounds and humming from the rear of the car, while on manuals symptoms also include stiff gear changes, a heavy clutch pedal and a clunking sound when switching off the engine. A good Porsche specialist will be able to repair most transmission problems, but you will want to ensure the cost of the imminent work is reflected in the price you pay for the car. Scored cylinder bores. This issue is talked about a lot on the internet, but is relatively rare on Boxster 987s. It can be a problem on the 3.4, but in our experience it is much more common in the Cayman engine than the Boxster. However, if the Porsche you buy is one of the unfortunate few you will be looking at a sizeable repair bill, so it is worth checking for signs such as low oil levels, sooty emissions on the exhaust tips and a tapping noise from the engine (generally from one side of the engine). If you have any worries, contact us about a pre-purchase borescope inspection at our Brighouse workshop, which will either reassure you or persuade you not to buy the car. Brakes. The brakes on the Boxster 987 are excellent, although you may not think so the first time you drive one. Porsche braking systems are not as heavily servo assisted as those in most cars and your unfamiliarity with them may lead you to assume the response is poor. Try an emergency stop on a quiet stretch of road during the test drive and you will soon see just how effective they are! It is worth checking how much life is left in the discs and pads before deciding how much to offer for the car. If discs have a rough surface, circular grooves or a pronounced outer lip, they will need replacing in the near future. Similarly, if the brakes squeak or the car pulls one way during braking, it is almost certainly a sign that repairs are needed. One other thing to check is whether the pads and/or discs have ever been replaced and, if so, were high-quality parts used and were they fitted by a Porsche specialist. Coolant radiators and air conditioning condensers. 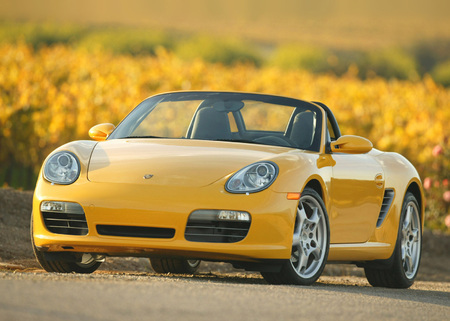 The design of the Boxster 987 means that the vents at the front of the car often get clogged with leaves. If the biomass is left to rot, it can cause the coolant radiators and air conditioning condensers to corrode. Check the ducts to see if they have been cleaned regularly and also look for stone damage to the air conditioning system. Replacing radiators and repairs to the air conditioning system can be expensive. Exhaust manifolds. An issue we are starting to see more of is cracked exhaust manifolds, which can be caused by heat stress or corroded bolts / fasteners. Excessive engine noise, exhaust fumes escaping from around the manifold and loss of performance are all possible signs of a crack, which can be difficult to spot by sight unless you have the facilities to inspect the underneath of the car. A cracked exhaust manifold will usually need to be replaced. Wheels. Corrosion is a common problem with the various wheels available with the Boxster and once it has started, the condition will deteriorate. Check for signs of damage, such as curbing and early corrosion, as it will mean the wheels eventually need to be refurbished. Roof. Check the operation of the roof when inspecting the car to ensure it goes up and down smoothly. Problems with broken push rods on the roof mechanism are common, but they are simple and relatively inexpensive to replace. The other thing to look for is evidence of leaks, particularly from the rear roof drains which can get blocked by dirt and leaves, forcing rainwater into the cabin close to an electronic control unit. Performance upgrades. Remember to ask whether the Boxster 987 you want to buy has any non-standard equipment or has had any performance upgrades. As well as changing how the car drives, it may also affect your insurance premium and how the Porsche is maintained. 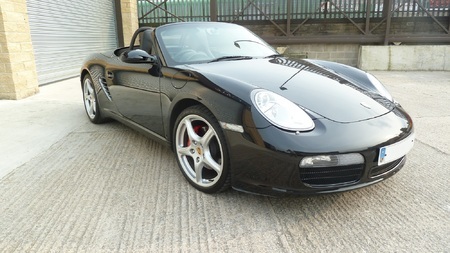 Here at Revolution Porsche, we can help to take some of the risk out of buying a used Boxster 987. We offer a Pre-Purchase Inspection, complete with full diagnostic check including Rev Ranges and a comprehensive report, carried out by trained Porsche technicians at our Brighouse workshop for £150 +VAT. You can also add a borescope inspection to the package for a further £99 +VAT. For more information or to book a car in, please call us on 01484 717342 or contact us via the website.